Prosthetics is a branch of dentistry dealing with restoration of lost dental crowns, bridges, veneers and complete dentures or removable partial dentures. Prosthetics is a very old dentistry branch as well as one of the most complex ones. It comprises fixed, semi-fixed and mobile prosthetics, and during the years it offered us some revolutionary solutions in restoration of lost natural teeth. When we talk about dental prosthetics we primarily think of dental crowns, bridges, complete dentures or removable partial dentures. Beside those, prosthetics also comprises solutions like veneers, inlay/onlay or all-on-4. These are only some of possible solutions for teeth restoration within dental prosthetics. 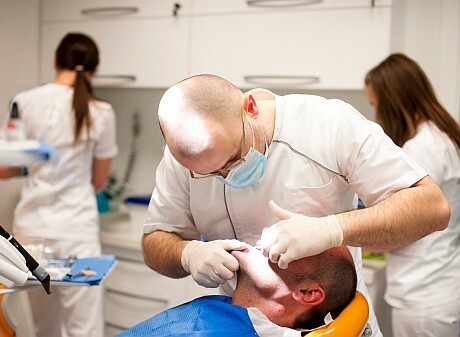 Dental Studio Vukic is the leading center when it comes to dental prosthetics and implantology in Croatia. What makes us different from others is our own dental laboratory employing 20 clinical dental technicians. Beside the expertise of our employees, our main advatage is the fact that each prosthetic replacement is individually tailored to the patient, and the final refinement is done directly in the patient's mouth, so it perfectly fits the prepared position. Using only the best materials of renowned world's manufacturers, we give at least a 5 year warranty on all our prosthetic restorations. More than 10.000 satisfied patients from all over Europe are a good enough reference and guarantee of the quality of our work.